"Panek's passion for the mysteries of dark matter and dark energy wins the day. 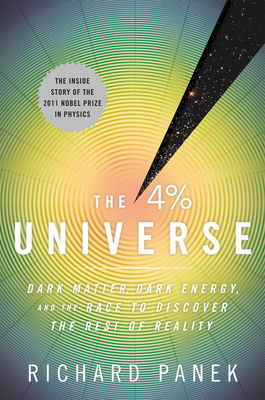 He succeeds because he recognizes that he's writing not just about red shifts and supernovae, but about people...the success of The 4 Percent Universe also stems from Panek's wisdom about how science works." "The balance between lively characters and provocative ideas keeps the book moving as quickly as any high stakes thriller, but the pay-off here is an answer of truly cosmic significance...the universe is keeping secrets from us--big secrets. Dark secrets. Panek's joyful journey through the wilds of modern cosmology gives us good reason to care about those secrets, and their sure-to-be surprising answers." "A superior account of how astronomers discovered that they knew almost nothing about 96 percent of the universe. Science writer Panek (The Invisible Century: Einstein, Freud, and the Search for Hidden Universes, 2005, etc.) points out that 50 years ago astronomers assumed they understood the cosmos and its history from the big bang to galaxy formation to its ultimate fate as expansion continued. One detail remained disturbing: Galaxies were moving too fast. Since gravity controls movements, they had to be heavier than predicted. By the 1980s, this "missing mass" problem became critical as it became clear that galaxies, including ours, were rotating so fast that missing mass far outweighs visible objects such as stars. Even after eliminating gas and dust, "dark matter" represents strange particles unknown to science. Astronomers also believed that gravity was slowing expansion of the universe but debated if galaxies would reverse themselves, continue to recede ever more slowly or (the favorite theory) simply stop. Panek describes frustrating struggles with high-tech detectors, complex computer algorithms and massive telescopes to search distant galaxies for the key. The answer came in the late '90s expansion wasn't slowing but speeding up. Flabbergasted astronomers understood that accelerating billions of galaxies requires immense energy. Since Einstein proved that energy and mass are equivalent, this "dark energy" makes up three-quarters of the universe. Dark energy added to dark matter reduces the familiar universe to 4 percent of the total. Panek delivers vivid sketches of scientists, lucid explanations of their work and revealing descriptions of the often stormy rivalry that led to this scientific revolution, usually a media cliche, but not in this case." "There has always been more to the universe than we can see. Science journalist Panek (The Invisible Century) offers an insider's view of the quest for what could be the ultimate revelation: the true substance of the unseen dark matter and energy that makes up some 96% of our universe. The search for these hidden elements began in the 1960s with astronomers asking whether the universe would end in an infinitely expanding "Big Chill" or a collapse into a "Big Crunch"--or whether the universe is a just-right "Goldilocks" space that would nurture stars and galaxies forever. To answer this question, scientists calculated the universe's mass and discovered there was far more mass than we could see. But where is this "missing mass" and what kind of exotic "dark" stuff is it made of? Panek gleefully describes a 'Wild West of the mind, where resources were scarce, competition was fierce, and survival depended on small alliances of convenience, often enduring just long enough to publish a paper.' This lively story of big personalities, intellectual competitiveness, and ravenous curiosity is as entertaining as it is illuminating."